If you haven’t checked out the Titan Souls demo from Devolver Digital, please do so before descending into the harrowing dungeon that is this first-look. Adventurers beware. 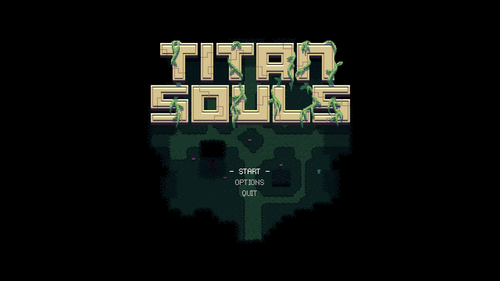 Titan Souls is veritable souls-like RPG, influenced heavily by elements of both genres. It’s an isometric, pixelated wonderland filled to the brim with… well… nothing, really. This is completely fine, contrary to how it sounds. Direction is implicit at this point in my gaming career, and piecing together a three-part puzzle is comparable to pointing and shooting. I loaded up the game with no context as to where I was headed, what I was supposed to be doing, and within the first five minutes of playing, the challenges I had yet to mount were laid before me next to a simple and concise control scheme. The game recommends you use a gamepad, but the arbitrary mapping – which allows you to press three or so buttons for the same effect – makes me wonder if there is going to be any more features imbedded in what appears to be a glorified stress test. and without a doubt I knew this would be an “enjoyable” experience. It’s an amalgam of my childhood and teenage years, sporting the layout and dungeon experience of A Link to the Past, the rolling and running from Dark Souls along with Skate‘s jedi-summoning tricks, and finally the boss-fest escapades provided by Shadow of the Colossus. That last part gets me though. I understand it’s a challenge to overcome, but trying to dodge a train without leaving the tracks is just making it easier for the coroners. The thing about hard games is the learning curve. I loved Dark Souls’ “tutorial” in which several methods of attack could test your mettle, and in the end you reap the gains of knowledge. Rogue-lites galore teach you upon each death the methods of survival, and all hell breaks loose if you don’t save seventeen times before entering a cave or dungeon in party-based RPGs. Titan Souls keeps it nice and tidy with a direct route to whatever boss bent you over, and thirty seconds to remind yourself where the exit menu is. The desire to win is great, and even now I’m mulling over strategies, deciding whether or not this masochism simulator is going to get the best of me. “Kill” being a blanket term for the various ways you can be pounded into red mist. no questions asked. There is an element of timing, meta-strategy, and a head-space which requires thirteen Redbulls and a pack of cigarettes to live inside. I looked around the map, taking a total of several minutes to explore every nook and cranny, disheartened when I realized the only plan of attack was throwing myself at the proverbial wall of spears until one day I broke through. There was only one character with their given strengths, and no one for miles to grind upon. It was death before rebirth, a purgatory in which this small girl (I assume) must fight titanic beings to obtain freedom. I killed all three bosses, perhaps the easiest, considering they’re demo material, but spiritually these bosses seemed to have the same difficulty. It didn’t feel impactful, weighted, or even well-deserved to shoot the Death-Star cosplayer in his big, stupid eyeball, or liberate the brain from a glacier, and I was eerily surprised when I actually John-Wayned them without even holding my breath. It was a kill-or-be-killed mentality in that moment, but when both you and the boss have 1hp to spare, the game minimalizes my beast-slayer attitude and relegates it to a 3-D shooting gallery. I want to fight the long fight, devs. Gamers: Keep your eye on this. It’s games like this that bring nostalgia and life back to the cluttered table of triple-A and indie titles alike. It’s clean, well designed, and offers potentially infinite hours of gameplay. The producers have given us some wonderful titles, I hope this is no different. Developers: If you’re reading this, understand these are qualms from an endeared heart. Narrow customization, world variation, and event states to prepare the character for each fight are detrimental to maintaining a prospective attitude, and if not that, give the boss fights a dimension akin to swordplay or dancing for that matter. Nothing feels better than trading blows with an enemy that outmatches you, only to fell them with a resolution of pure skill. On top of that, either more characters to choose from, or a local multiplayer option gives TS a greater chance for replayability and caters different play styles as well as built-in networking. In regards to the input graveyard, taking full advantage of the gamepad is much more than giving outs to a dead man, it’s giving diversified strategy rather than waiting for your opening and blindly firing. Buffs, boons, booze, and more can be attached to those infinitely pressable buttons; I know my hands could use the workout. The game might change upon release, and if it does, then consider these words melted cheese. I’ll be getting it on release and offering a full-fledged review, but until then, I just hope I can piece my controller and dignity back together. Previous post: New to Pixelpine: Game Previews!